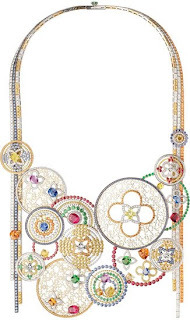 The first is L'Aime du Voyage Massai necklace,with various floral rings and colorful pearls inside the rings.The whole necklace presents a unique and fashionable look. 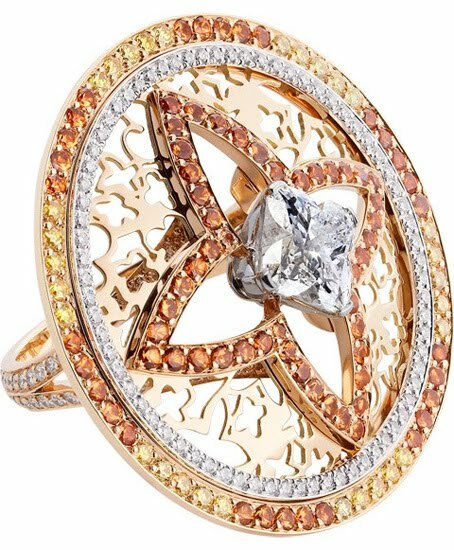 The second one is an L'Aime du Voyage Massai ring,with an outer topaz circle and silver diamond in the second circle.The center is a star-shaped with topaz on it and a big silver diamond in the middle,presenting a noble and luxurious quality. 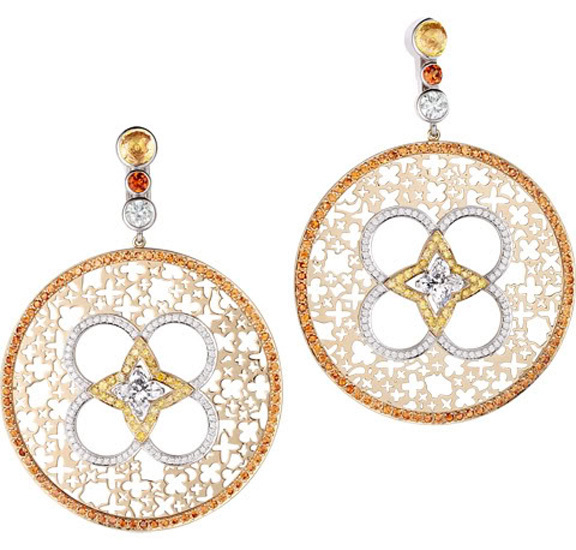 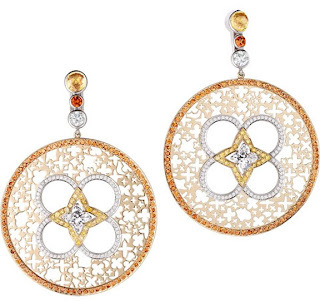 The third one is a pair of L'Aime du Voyage Massai earrings,with round topaz circles embeded with topaz and inside a petal-like,finally a topaz star shape and a big diamond in the center. 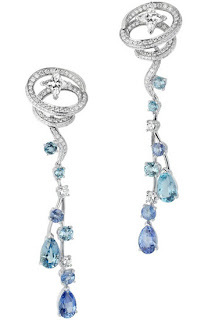 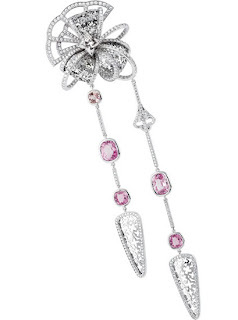 A silver diamond,a rubby and a topaz are listed on the hooks,presenting an elegant look. The next one is a pair of Louis Vuitton L'Aime du Voyage Massai pendants,which have the same pettern as the earrings ,except for the sapphire and silver diamond bands on their tops and bottoms.Also some blue sapphires are embeded on the second round. 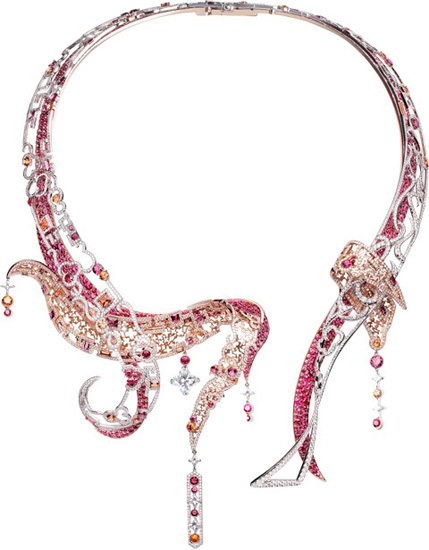 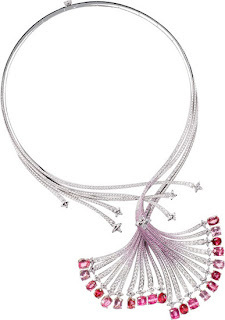 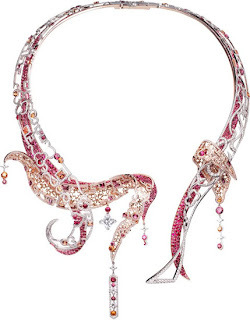 Here comes the Louis Vuitton L'Aime du Voyage Geisha necklace,with a diamond bowknot and diamond beadings as the tassel.There’re mauve diamond trimmings. 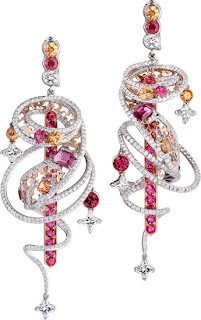 The skeleton golden lace L'Aime du Voyage Geisha brooch is designed by Lorenz,which has a bowknot diamond and petal trimmings on the end.There are two mauve diamonds and a topaz on the diamond chain,a triangular trimming with two mauve diamonds on the other. 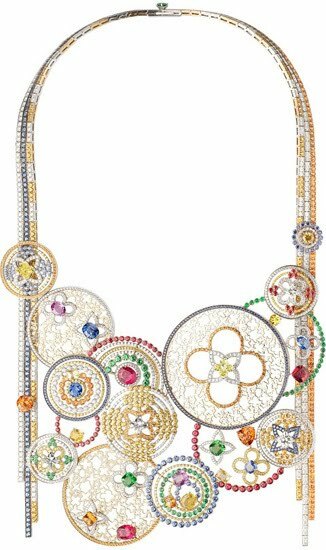 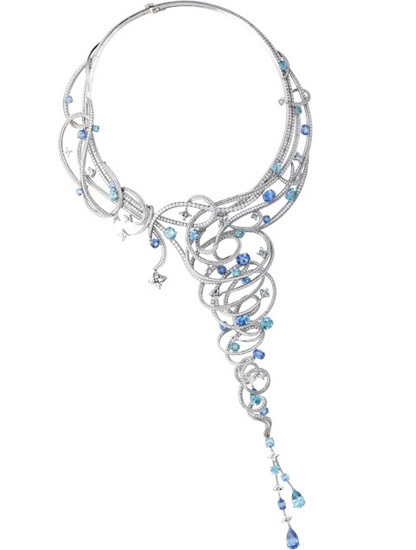 This waning-shaped Louis Vuitton L'Aime du Voyage Cabaret necklace is really cool, isn’t it? 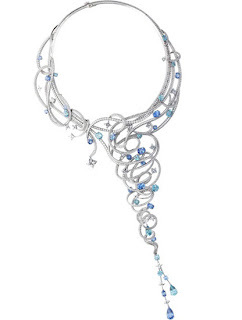 The twisted silver chains are all trimmed with diamond studs. 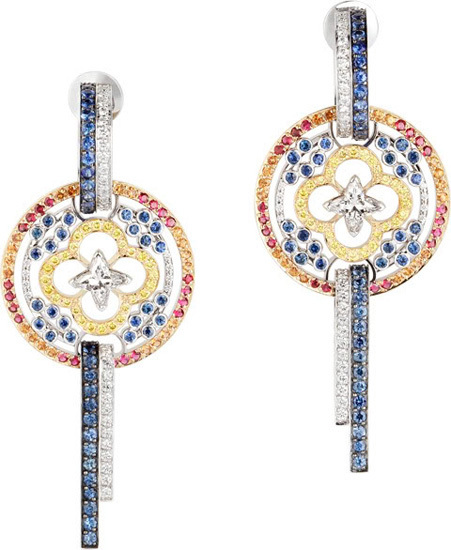 With two bigger sapphire diamonds,five sapphire studs and two silver ones respectively on each earring,this L'Aime du Voyage Cabaret earrings have twisted overlapping diamond and a silver diamond star on the round.The diamonds will swing beautifully as you walk with the earrings. Mainly trimmed with mauve diamonds studs and topaz studs,this L'Aime du Voyage Shangai necklace shapes like a fish or a little bird at the end.The hanging diamonds add flair to it. More complicated as they can,this pair of L'Aime du Voyage Shangai earrings present a dazzling and glaring feeling,you will become the focus of the prom wearing this pair of earrings. 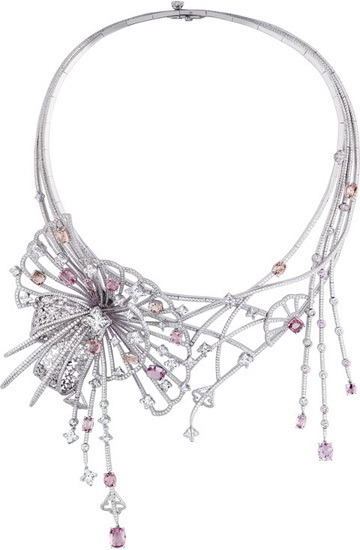 With fan-shaped bracelets at the bottom,this L'Aime du Voyage Seville necklace takes on a jhi look.the mauve diamond studs attached to the bracelets contribute a lot to its beauty and luxury. 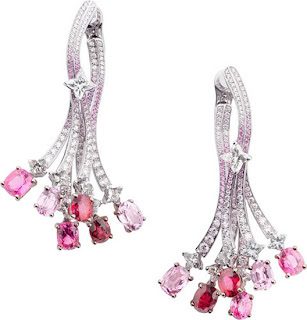 This pair of L'Aime du Voyage Seville earrings are made of diamonds bands and mauve diamond studs attached.The star-shaped silver diamond makes them more shining.Beside the mauve color over the bands creates a colorful scene for your ears.